Definition at line 259 of file lscript_execute.h. Definition at line 262 of file lscript_execute.h. Definition at line 263 of file lscript_execute.h. References LLLinkedList< DATA_TYPE >::addData(), bytestream2integer(), i, mEventDataList, and S32. Definition at line 281 of file lscript_execute.h. References LLLinkedList< DATA_TYPE >::deleteAllData(), and mEventDataList. Definition at line 286 of file lscript_execute.h. References LLLinkedList< DATA_TYPE >::addDataAtEnd(), LLLinkedList< DATA_TYPE >::getLength(), MAX_EVENTS_IN_QUEUE, and mEventDataList. Definition at line 308 of file lscript_execute.h. References LLLinkedList< DATA_TYPE >::getFirstData(), mEventDataList, NULL, and LLLinkedList< DATA_TYPE >::removeCurrentData(). Definition at line 293 of file lscript_execute.h. References LLLinkedList< DATA_TYPE >::getFirstData(), LLLinkedList< DATA_TYPE >::getNextData(), mEventDataList, LLScriptDataCollection::mType, NULL, and LLLinkedList< DATA_TYPE >::removeCurrentData(). Definition at line 333 of file lscript_execute.h. References LLLinkedList< DATA_TYPE >::getFirstData(), LLLinkedList< DATA_TYPE >::getNextData(), LLScriptDataCollection::getSavedSize(), mEventDataList, S32, and size. Definition at line 319 of file lscript_execute.h. 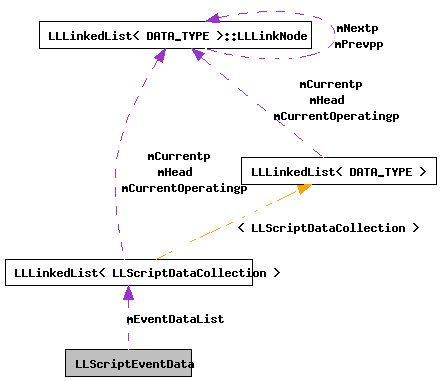 References LLLinkedList< DATA_TYPE >::deleteCurrentData(), LLLinkedList< DATA_TYPE >::getFirstData(), LLLinkedList< DATA_TYPE >::getNextData(), mEventDataList, and LLScriptDataCollection::mType. Definition at line 272 of file lscript_execute.h. Definition at line 348 of file lscript_execute.h. References LLLinkedList< DATA_TYPE >::getFirstData(), LLLinkedList< DATA_TYPE >::getLength(), LLLinkedList< DATA_TYPE >::getNextData(), integer2bytestream(), mEventDataList, S32, and LLScriptDataCollection::write2bytestream(). Definition at line 364 of file lscript_execute.h. Referenced by addEventData(), getNextEvent(), getSavedSize(), LLScriptEventData(), removeEventType(), LLScriptExecute::run(), set(), write2bytestream(), and ~LLScriptEventData().